May is Motorcycle Safety Awareness Month. May is Motorcycle Safety Awareness Month and the Department of Licensing (DOL), Washington Traffic Safety Commission (WTSC), Washington State Patrol (WSP), and the Washington State Department of Transportation (WSDOT) have teamed up to remind drivers of cars, trucks and buses to look out for, and share the road with, motorcycle riders. Target Zero is Washington’s Strategic Highway Safety Plan to reduce the number of traffic fatalities and serious injuries to zero by the year 2030. In Washington, motorcycle deaths are not steadily declining like overall traffic deaths. From 2011 through 2013, motorcycles made up just 4 percent of the registered vehicles on our roads, but accounted for almost 17 percent of all traffic fatalities (225 of 1327). 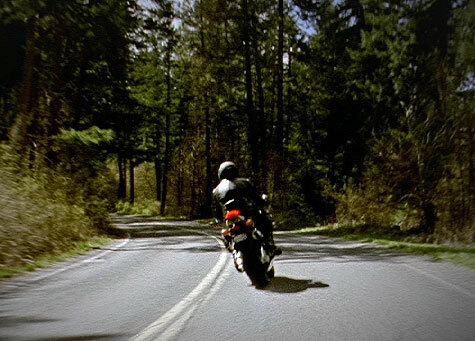 In just the first four months (January-April) of 2015, there have been nine motorcyclist fatalities. The five year average (2010-2014) for this same four month time period is 12 fatalities. Speeding, running off the road, and riding under the influence of alcohol and/or drugs are the main contributing factors in these crashes. Motorcyclists should always ride sober and within the posted speed limits, get the required training and endorsement, and wear DOT compliant helmets and protective gear. 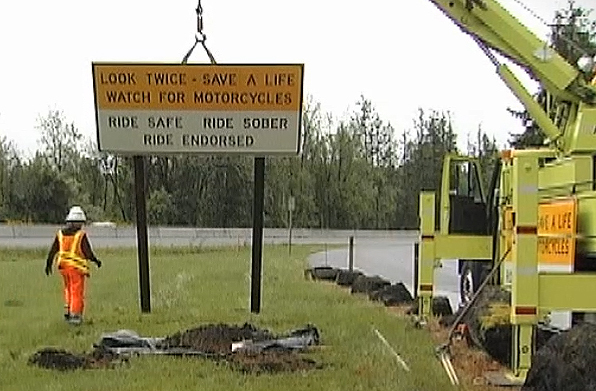 Several projects are underway in Washington to reduce serious motorcycle crashes. A campaign called “It’s A Fine Line” promotes safe riding through social media outlets including Facebook, Twitter, and YouTube. DOL training contractors are distributing motorcycle hangtags to dealerships statewide to encourage riders of all skill levels to get certified training. DOL also produced a motorist awareness video that has gone viral. It’s titled, A Second Look. Motorcycle Safety Awareness Month is a national initiative designed to encourage drivers of all other kinds of vehicles and motorcyclists to share the road with each other. For more information on motorcycle safety, visit www.nhtsa.gov/Safety/Motorcycles. (Seattle) The year was new, the weather still dark and cold when a threat to drivers intensified during the morning rush-hour on Interstate-5. An SUV traveled south in the northbound lanes. It struck one vehicle, then continued. Then, it struck another. Still, the SUV pressed on. Trooper Sean Carr heard the call from dispatch on that January morning. Carr understood the threat level. “Lots of people are off to work, getting kids off to school or getting them to daycare,” he recalled months later. As Carr travelled north on I-5, the SUV approached and showed no sign of slowing. “I had to take her SUV head-on with this patrol car,” Carr shared. Carr, whose wife and father-in-law are also state troopers, knew this was the type of moment he’d signed-up for when he joined the Washington State Patrol seven years earlier: a moment to serve and protect. Carr said he made a split-second decision. “I knew there was a trooper behind me, who was actually a cadet, with his field-training officer riding with him. They were in direct line with the SUV behind me. There was plenty of northbound traffic already on the roadway… And I knew that she’d already struck two other vehicles and continued. And if I did not put myself in front of her, she was going to keep going. The memory of the moment of impact on that morning nine months ago has stayed with him. “I think about it every time I put on my vest on and jump in my car,” Carr said. Incredibly, no one was seriously hurt. Safety features built into the patrol car—crumple and crush zones—helped minimize Carr’s injuries. His vehicle returned to the road after two-months in a repair shop. Police said the SUV’s 19-year-old driver was intoxicated. Carr is acutely aware that the driver and her passenger were fortunate to have survived. Carr recalled the moment when police first made contact with the impaired driver in that crash. Carr said that, in one year alone, he responded to three cases involving wrong-way drivers who were drunk. “I personally can’t stress enough the importance of communicating with your kids,” Carr said. 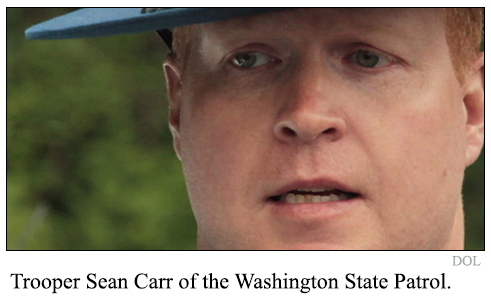 DOL produced the two videos below featuring our interview with Trooper Sean Carr. Summer is a time for parties and picnics in the sun, but don’t let a DUI ruin your fun. Even though Washington legalized marijuana for adults 21 and older, it is still illegal and dangerous to drive under the influence of marijuana or alcohol. “Specifically, we want people to know that marijuana doubles the risk of a fatal crash,” said Darrin Grondel, Traffic Safety Commission Director. “With new retail marijuana stores in the mix, we want to remind the public that prescription and over-the-counter drugs, as well as illegal and recreational drugs, can impair driving ability,” Grondel said. That is why between August 15 and September 1 extra officers will be on our roads looking for drivers under the influence of alcohol, marijuana, or other drugs during the annual Drive Sober or Get Pulled Over campaign. Many of these officers have special training to identify when a driver is under the influence of drugs as well as alcohol. Drivers are encouraged to find alternative transportation or ride with a sober designated driver. “More people may be using marijuana recreationally, but that should never be mixed with driving,” said Lt. 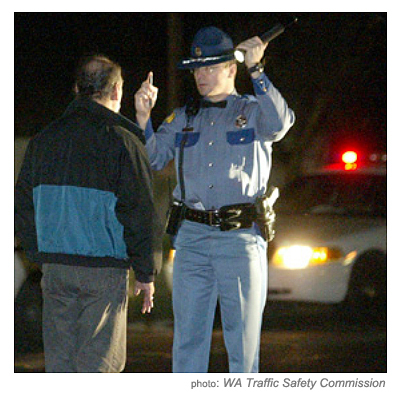 Rob Sharpe, Commander of the Washington State Patrol Impaired Driving Section. Lt. Sharpe noted that law enforcement has been arresting drugged drivers for a long time and will continue to identify and arrest drivers who make the poor choice to drive under the influence of marijuana, alcohol, or other drugs. Additionally, law enforcement reminds young drivers that impairment laws are much stricter for anyone under the age of 21. A young driver who has any marijuana in their system or a blood alcohol concentration of .02 or higher is considered to be driving under the influence and is at risk for arrest. One hundred and sixty-six law enforcement agencies in Washington have obtained grants to participate in this Drive Sober or Get Pulled Over campaign. Police departments, sheriff’s offices and the Washington State Patrol will be working together to cover the state in extra DUI enforcement. All of these extra patrols are part of Target Zero—striving to end traffic deaths and serious injuries in Washington by 2030. For more information, visit www.targetzero.com. Additional information on the Washington Traffic Safety Commission can be found on the website, www.wtsc.wa.gov. If your driver license is suspended due to unpaid traffic tickets, a DUI or a number of other things, it can be a challenge to navigate the court system to get it back. For the nearly 300,000 Washingtonians with a suspended license, things are about to get a little easier. We’ve rolled out a new web-based service that shows people what they need to do and who they need to contact to get their license back. Users can securely enter their personal information and the system will provide a printable list of the court issues and state requirements needing to be resolved. It also provides contact information for each item. It is available at the DOL website. Are you one of the 70? Is your spouse? How about your children? Your teacher? You are currently browsing the archives for the Washington State Patrol category.